This is the worst possible "VPN" which it does NOT hide your IP plus it logs your activity and with all the arrogance they tell you that it "encrypts" your data. Hmm... Don't we have that already with https, ssl sftp, etc for free ? I am disappointed that there are no negative star ratings for this extremely dangerous malware. 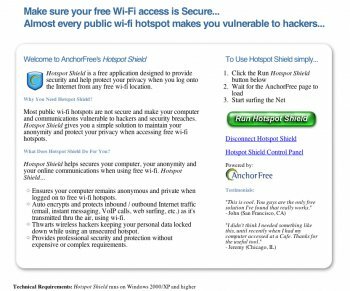 Please never use Hotspot shield ever. This vpn logs your ip address and most thing you do with their vpn for months on their server and they will give it to NSA if asked. I use Private Internet Access, a true anonymous vpn that allows p2p and every protocol and has a strict 'no log' policy, they don't log anything and have 256bit/256SHA/4026 RSA encryption and its uber fast and doesn't slow your internet like other vpns. You can use upto 5 devices and its compatible with even ddwrt. All the vpn out there are not as secure and anonymous as this one. Worse VPN ever. It does NOT protect HTTPS connections. 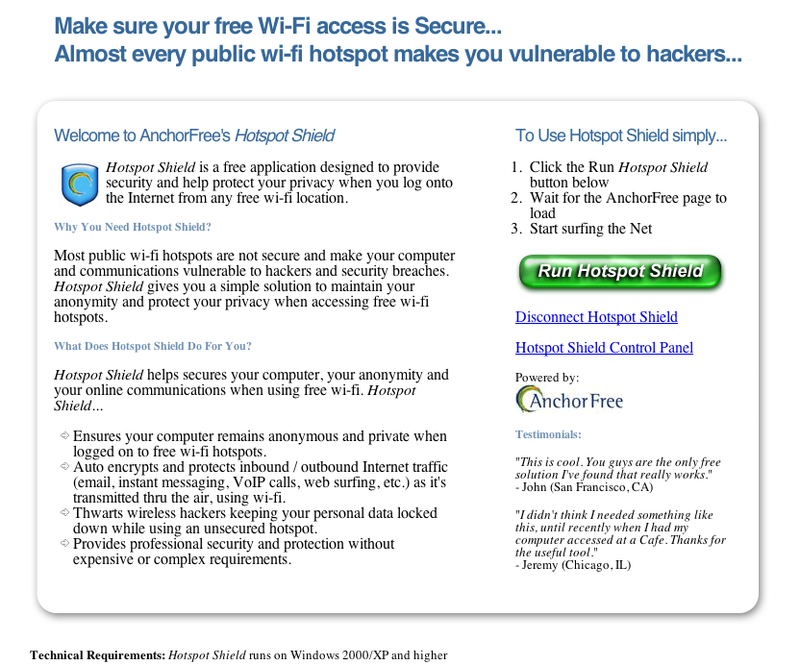 Hotspot Shield support even recognized in a support ticket. I have an Elite account with I do not use for anything because it's useless. This is not a proxy, it's a VPN-client. This app is giving you infact a new ipadress by a proxy server wich also can be done by going to proxy.org yourself.Its working allright and handy to use with an icon in the systray (on the start of Windows its in disabled mode). Offcourse it slows down the connection by the use of a proxy adress.I use it when i do not trust the site fully.In the firewall a lot rules have to be created allthough first time.Not only suitable for wifi connected laptop but also for the lan connected pcs offcourse. Excellent, but a little bit slower than other free alternatives and display banner ads on the top, need each time click to hide after reload or surf to another page.